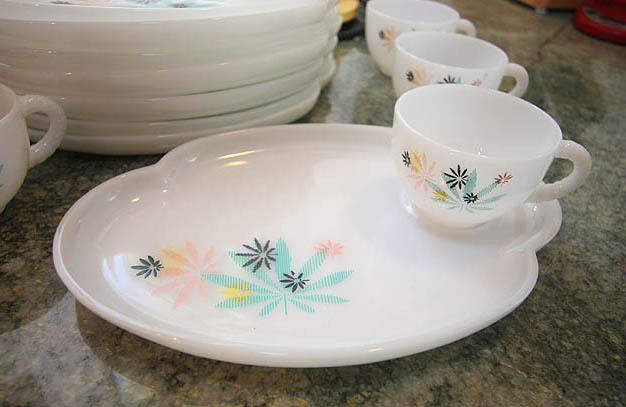 Today, I received my snack plates from Little Owl Vintage. I ordered them with my gift certificate from the Beauty that Moves June giveaway! They’re definitely some of my most treasured pieces of vintage goodness! You picked a great set! I love it! Ack! Those are SO cute! I was just looking around blogville and saw the picture of your new lunch set. I have two plates that match yours but have never been able to find the cups. I bought mine at a thrift store last summer. I am still looking for them. Enjoy your treasure. There are some places that have extra china pieces and such, I had a couple plates and a cup that broke one time and my step mom found this place that actually had replacements and I got all new peices and because they sold the saucers and cups together I have an extra cup, I think you can find some of them in the back of like Southern Living or Better homes and Garden, try one of those they might have your “spare”! I LOVE that set! They’re beautiful! Have you tried watching eBay for that pattern? I found some amazing stuff on there when I was collecting dishes with violets on them! It was like a treasure hunt! Enjoy!